There are quite a few synonyms of “Contrast” like Dissimilarity, Variation, Gap, Difference, Divergence, Unlikeness, Disparity etc. I want to add one more word in this list “India”. This crazy country is beautiful, vibrant & deep. When you think that you know a lot about India it presents some new permutation & combination leading to countless invisible probabilities. These ‘punny’ stories attempt to cover few related yet contrasting aspects present in India. I wrote many write-ups during my school & graduation years & I have quite a few promising ideas in my rugged jhola. I will continue to explore India & write on imperative aspects related to Bharat. 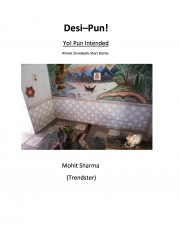 Mohit Sharma 'Trendster', is a freelance Writer/Poet, Photographer, research student, social activist (Education, Poverty, Child Labour, Men's Rights & Fight Against Negative Generalization...stereotypes). Related Keywords - Trendster, Sameer, Trendy Baba, Sharma ji, Zehen, Raka, Mohitness, Freelance Talents, Mohit Trendster. Amazing read.......I got a chance to experience the real India and learn important information about it...The Earth Show, Fire's Sermon, Art of Bargaining, Rates of Education, were masterpieces in this book. Genius! This is a complete package from every point. The writer showed various stories ranging from cynical, emotional, satirical, comedical, social......You are an amazing and versatile writer!